HELLOOOO EVERYBODY!!! Especially to my chinese friends! We are just a few days away from Lunar New Year! Excited!!!! We are going to send the year Rooster on its cycle journey and welcome the year of the Dog! For those who have had a rough Rooster year, not to worry, you will do better in the year of the Dog. As for those who have a smooth Rooster year, may you continue to be as smooth in the year of the Dog. But whatever it is, it is time to collect Ang Pows, go for family visits, catch up with your cousins, stuff yourself with those bak kwa, pineapple tarts, prawn crackers and all those tidbits! Lots and lots of non-stop eating, so do control yourself ok! Talking about eating, the one meal that is a chinese custom is the reunion dinner. It is considered the most important meal of the entire year where all the family members come together no matter how far they are. So what are your styles of reunion dinners? Traditional dishes or the steamboat style? I think most families go for the steamboat style because it is less of a hassle and there are more dishes and more varieties, especially if you have a BIG family. While there are chinese steamboats, did you know that there is another version of steamboat too? And that my friends, is the topic for today! Swiss Fondue in Switzerland! It is their version of steamboat! Fondue originated from Latin, fundere which means “to melt”. Switzerland, besides being famous for good watches and nice chocolates, it is also very well known for their 450 varieties of cheese!!!!! 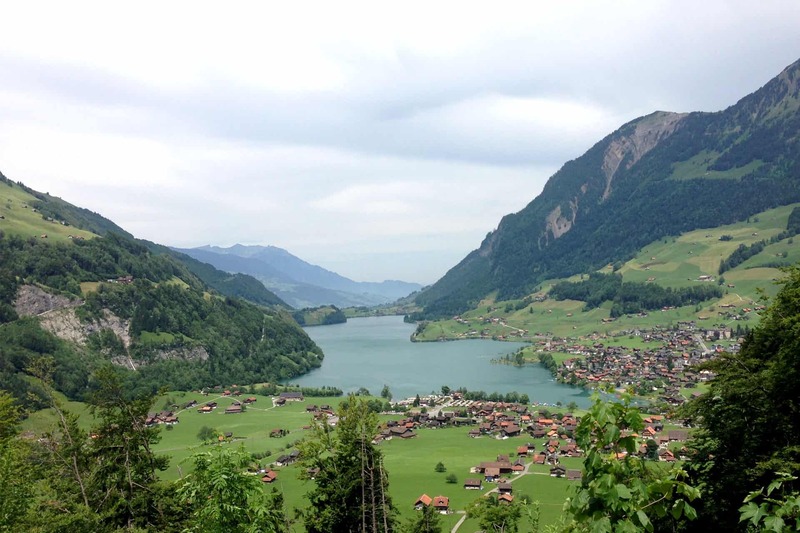 Did you know that Switzerland used to be a very poor country? The Swiss people used cheese as a currency to do trading with each other in the past! If a family has lots of cheese, it means that the family is wealthy. More cheese, more wealth! While the cheese can secure your wealth, it is also a source of food for the people in the country. 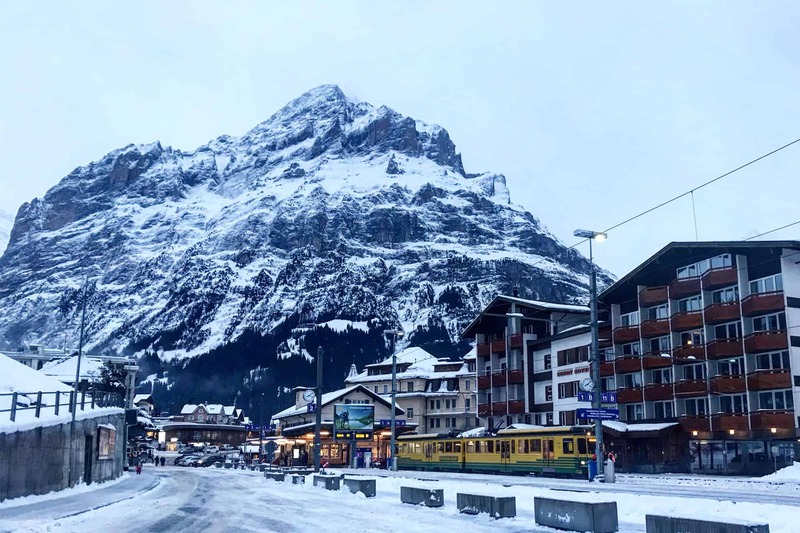 In Switzerland, over 60 percent of the terrain is mountainous, it can become extremely difficult to head out to buy food during the winter season. Using whatever they have left, wine and cheese to make a hot meal to keep themselves warm during the winter. So the only way was to melt the cheese and dip hard bread into the melted cheese. That was how the Swiss Fondue came about in the region of Valais (Valley). The Swiss Fondue became a winter tradition food to have on the dining table and since then, it has evolved to include alot more varieties besides bread. The Swiss people include fried beef, fruits or even vegetables, as long as it goes well with melted cheese! The best time for Swiss Fondue is during the Winter Season! There are 4 types of fondue that can be found in Switzerland! 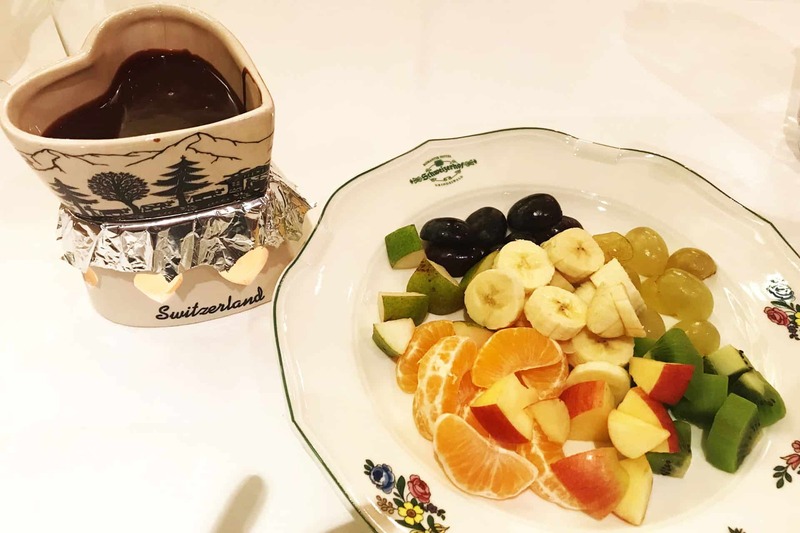 They have the Cheese Fondue, Meat Fondue, Chinese Fondue and not forgetting the all time favorite, most popular among women and children, the Chocolate Fondue! Something to note is that when you say Swiss Fondue, it automatically means Cheese Fondue, so don’t mistake it for White Chocolate Fondue ok! The Meat Fondue, Chinese Fondue and Chocolate Fondue are iterations from the Cheese Fondue. There are 4 types of fondue that can be found in Switzerland! They have the Cheese Fondue, Meat Fondue, Chinese Fondue and not forgetting the all-time favourite, most popular among dessert lovers, Chocolate Fondue! Something to note is that when you say Swiss Fondue, it automatically means Cheese Fondue, so don’t mistake it for White Chocolate Fondue ok! 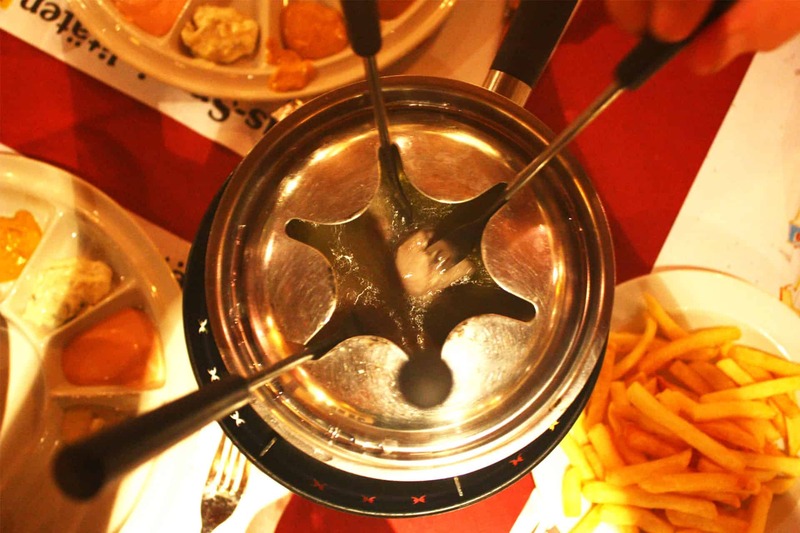 From Cheese Fondue, the Swiss then came up with the Meat Fondue, Chinese Fondue and Chocolate Fondue! The Cheese Fondue is basically made up of 2 kinds of cheeses. The Gruyère (pronounced “groo-YAIR”) Cheese and Emmental (pronounced “EM-en-tall”) Cheese. The Gruyère Cheese is made fully from cow’s milk. It is cured for 6 months or longer. When tasting the pure product, it has a rich yet slight nutty taste. To identify gruyère cheese, it has a firm texture with a pale yellow color and also a few small holes or “eyes”, which a characteristic of Swiss cheese! Did you know that the holes are formed by gas bubbles released by the bacteria that are used in making the cheese! The Emmental cheese is also made fully from cow’s milk, but however, it has a much buttery tastes and slightly more sharp nutty taste. As compared to the gruyère cheese, the emmental cheese also has a pale yellow colur but has a lot more “eyes”. The gruyère cheese has small and fewer “eyes”.Fun Fact: Emmental cheese is the cheese that is in Tom and Jerry’s cartoon! The 2 cheeses melted relatively well as they have high water content as compared to other cheeses. White wine, garlic, nutmeg and other seasoning are mixed in together with the melted cheese and viola! Cheese Fondue! The Meat Fondue uses fresh oil instead of cheese! It is basically deep frying your ingredients in the oil at high temperatures, hence it is better to use an oil with a relatively high smoke point, if not, your house will be filled with smoke from all the deep frying. Any refined oil are the oils to use as they have a higher smoke points. The highlight of Meat Fondue is of course meat! Recommended meats are tender cuts of beef or pork and chicken breasts. But you can choose other ingredients as well, just make sure that it is in bite sizes, small enough to be put into the sizzling hot oil! The cooked meat is then dipped in mustard sauce, curry sauce, cocktail sauce or any other different kinds of sauces at your preference! The Chinese Fondue, is of course similar to our version of Chinese steamboat, it is soup based. The only different thing is that the pot used is smaller as compared to the Chinese steamboat which uses a bigger pot! The ingredients for the Chinese Fondue are all either thinly sliced or in bite sizes to accommodate for the small pot and also the use of long fondue forks instead of chopsticks. The Chocolate Fondue, a dessert that is like by everyone and the easiest to prepare! You just need to prepare the chocolate that you prefer, milk or dark chocolate, heat it in a small bowl over a simmering water bath! You may add in milk or cream and stir until smooth before putting in into the fondue for all to enjoy! You can choose a wide range of ingredients for the Chocolate Fondue! From fruits to sweets to biscuits! There is definitely something for everyone! Cheese Fondue ,made up of two different types of cheese,white wine,garlic,nutmeg and other seasoning. 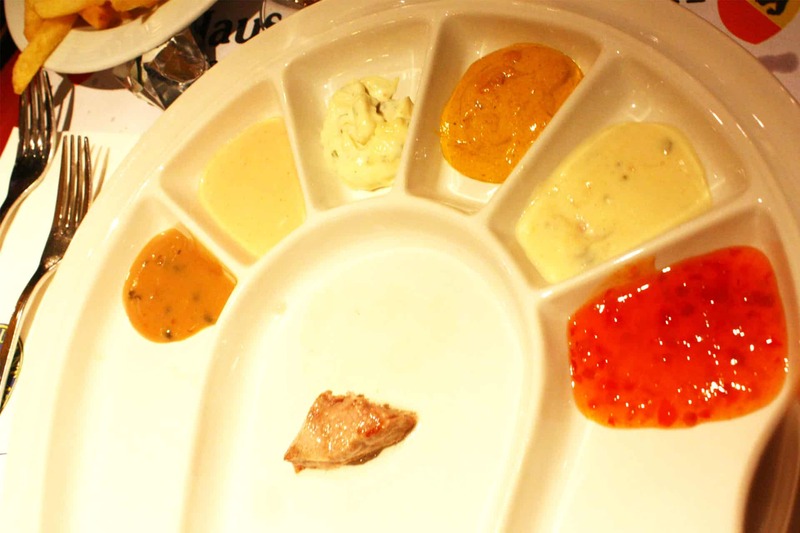 Different Sauces for you to dip your meat for Meat Fondue. 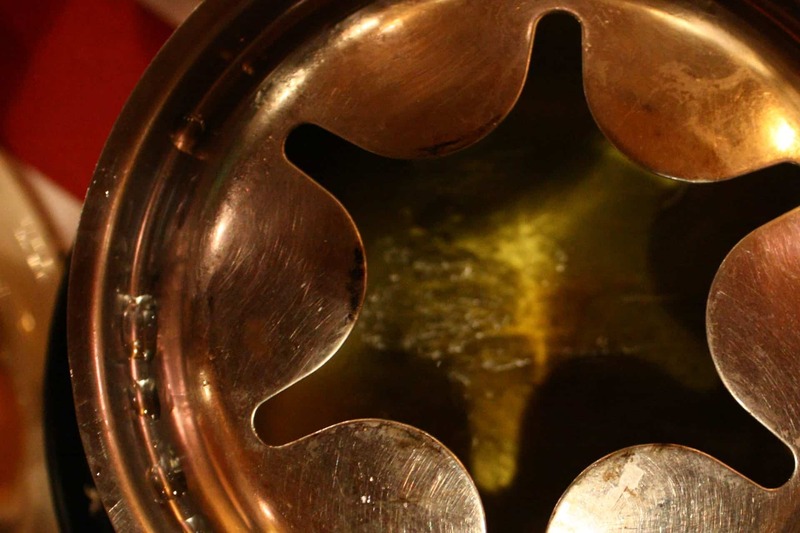 Meat Fondue Base – Oil for your meat to be deep fried. Romance Boiling in a Pot ! The Cheese Fondue is eaten with a long-handled fondue fork. One fork to one guest. When the Cheese Fondue is served, it comes with bread that has bee cut into cubes. 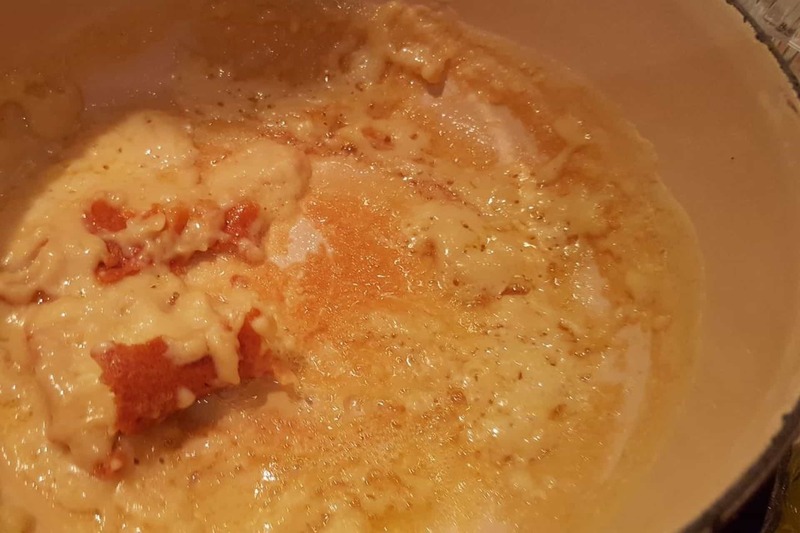 Using your fondue fork, you spear a piece of the cube bread and dipped into the communal pot of cheese, you then swirl the piece of bread around the pot to maximize getting the goodness of the cheese. After that, you bring the cheese covered bread back to your plate and slide it off using your dinner fork before indulging in the overwhelming goodness. However, don’t swirl your bread in the cheese for too long before it disintegrates or drops into the pot. Because according to the Swiss traditions, there is a saying that if a couple is eating the Swiss Fondue and if the lady drops her bread into the pot or if she lost the bread while dipping in the cheese, she will have to give the gentlemen a kiss! Likewise if the same thing happens for the gentlemen, he will have to treat a lady a glass of wine during the next dinner date! So if it is your first date with a girl or just simply looking for ideas on where to go have a nice dinner on Valentine’s Day which is happening in a few days time, why not consider a Fondue meal! Who knows, you might be able to kiss your crush or get a kissed while having fun! You might want to start with Cheese Fondue as a starter followed by Meat Fondue as the main and then ending off with the best, Chocolate Fondue! Using a long fork to coat the bread and put it onto own plate is the right etiquette when eating Swiss Fondue! The winner secures the bread to his/her own territory! Eating Swiss Fondue can be very Fun! 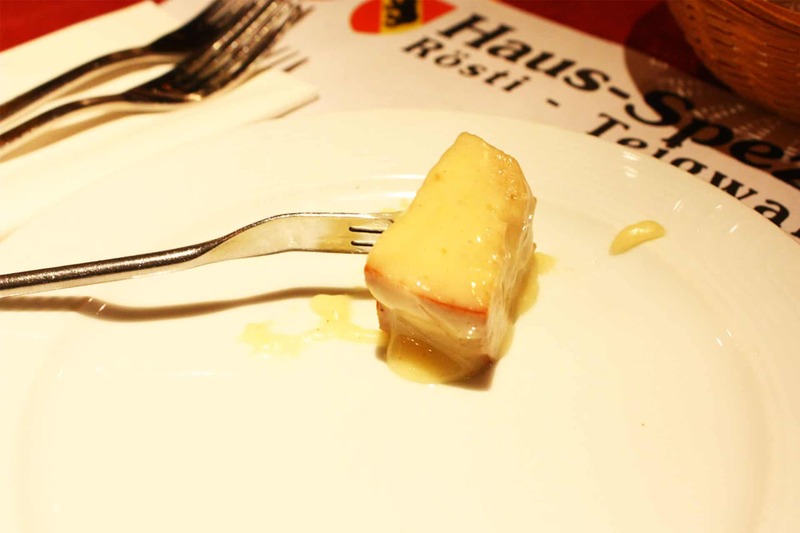 In Swiss traditions, when you eat Swiss Fondue in a group and if a person drops the bread or loses the bread in the pot after dipping it in cheese, the Swiss would suggest a penalty for him/her. So the penalty can be a true or dare game or just simply washing the dishes or clean up after the meal. So are you game enough? Remember not to swirl your bread too long until it disintegrates! Chinese New Year approaching! Might wanna considered having some fun to decide who gets to do the dishes after reunion dinner! The Rule still Applies for whoever who drops the meat into the oil will get the penalty! There is a story told, revolving around the Swiss Fondue that brought peace. During 16th century, when the religious war broke out in Swiss, there were two Swiss armies fighting with each other. A lady who was cooking Swiss Fondue nearby, came by to offer them cheese fondue before their fight. Both sides smelled the delicious Cheese Fondue and decided to stop the war, for they realized that they were actually people of the same country who love cheese fondue. They then sit down and settled their difference, over a delicious meal of Cheese Fondue. 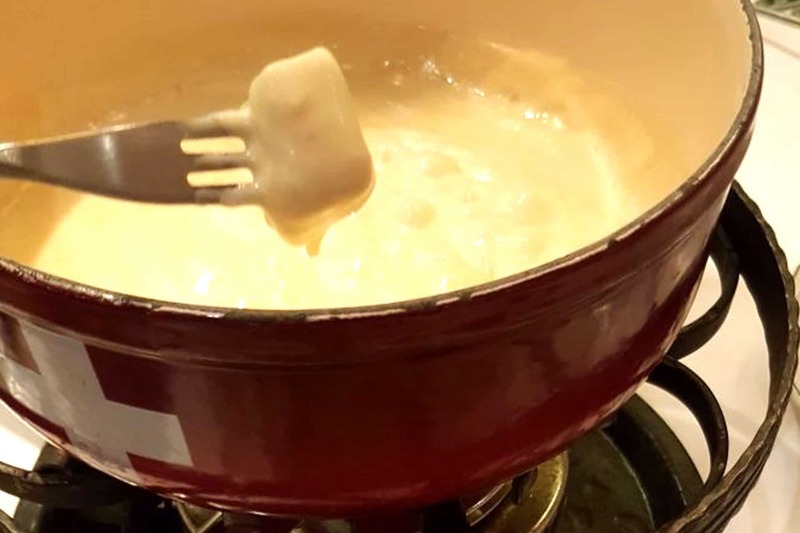 A food that keeps the people Together – Cheese Fondue in Switzerland! Before starting to indulge in this Swiss traditional dish, I would like to remind you that eating the Swiss Fondue is like tasting wine. You may not like the smell of it at first, but as you go along and you eat more and taste more, you will begin to find that you actually enjoy eating Cheese Fondue! The more you eat! The better it tastes! The best part is the last part! One tip to let you in is to let the flame to continue to cook the last bit of cheese at the bottom of the pot. The cheese is being roasted until a dark crust forms. This crust is called the Religieuse. It is chipped off and scrap from the pot and served. It tastes heavenly! 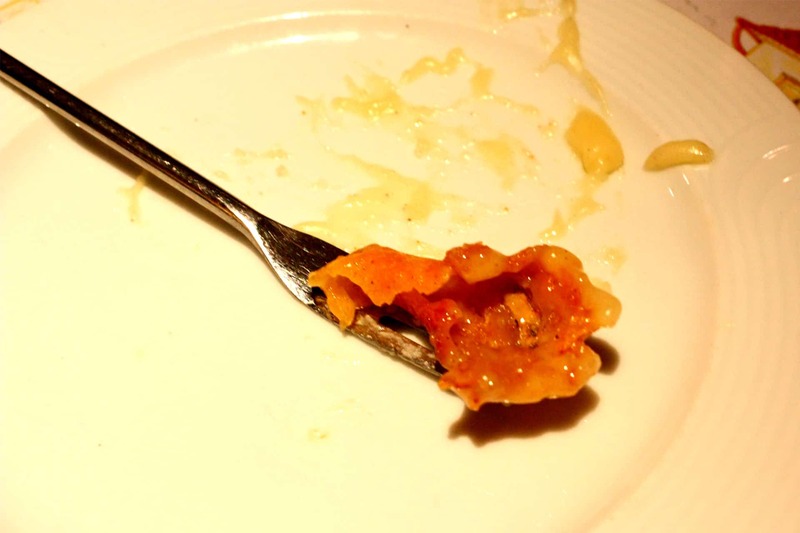 So never ever let the waiter or waitress take away when you are left with a little cheese, because that is the best part of the whole dish! The best part is worth the wait and patience while letting the cheese slowly roast over the simmering fire. Even people who do not like cheese love this! You have to TRY this during your visit to Switzerland! Best thing ever! What’s Your Favourite Fondue till now? My favourite is the Chocolate Fondue, as I have sweet tooth!!! All dessert lovers will give their vote to this lovely pot of Chocolate Fondue too. Remember that the Swiss is famous for their chocolates too, especially milk chocolate? That is because the milk in the milk chocolate comes from the cows in Swiss. 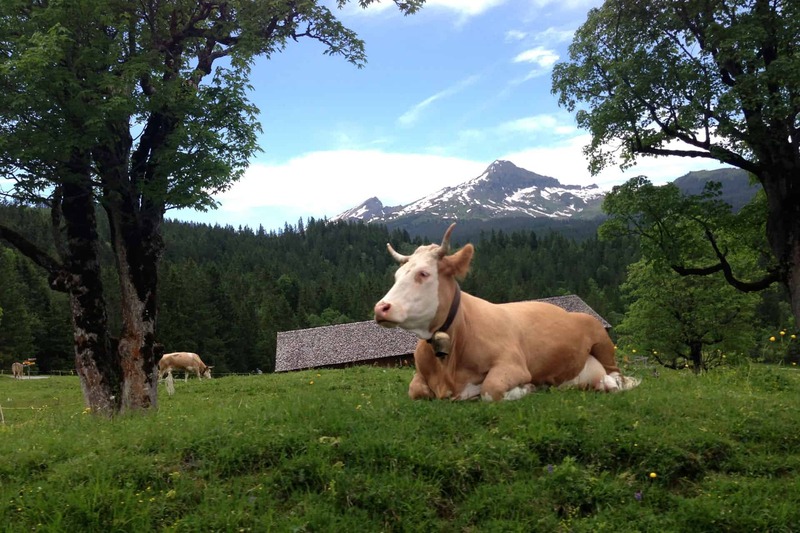 The reason for the milk to be different is because the cows in Swiss do not have much stress! They just laze around all day and feed on green pastures which in turn, produces top quality milk. The freshness of the chocolate makes it unstoppable for indulging the whole pot on own. Besides chocolates, the cow’s milk is also used in making the cheese as well. That is why the best thing to eat in Swiss is cheese and chocolates! Norman’s favourite fondue is of course the Meat Fondue! The sound of the meat sizzling in hot oil while waiting for it to be cooked, people around the table can indulge in other kinds of food or just interact with each other over a glass of beer! This is how eating dinner with family and friends should be! Took this during a train ride up Jungfrau during June!Many had asked whether the cow is real…IT is For Real for Sure! Chocolate Fondue in a lovely heart shape pot. To up the romance level! So now that you know that there is another version of the hotpot, the Swiss way! You may consider making a fun element when you are have your steamboat reunion dinner. You also can have both a Chinese steamboat for dinner and end off with a Chocolate Fondue as dessert! Whatever it is, it is important to stay in harmony as a family! If you are already craving for some fondue or you are gunning for ideas for a group gathering or even your datenight, Wine Universe Singapore do serve Cheese Fondue! YEAAAAAAHHHHHH! So you can go for your Cheese Fondue fix in Singapore but as usual, our advice is for you to visit the country where the food originated so that you not only can taste the authenticity of the cuisine but also be able to experience the culture first hand. So here, we, CrazyAdven2ras would like to wish all of you our readers and supporters out there, a very HAPPY and PROSPEROUS LUNAR NEW YEAR and may you HUAT BIG BIG (get rich) in 2018 with lots of health and wealth and FUN in your life! Remember to subscribe to our blog and Youtube channel to get the latest updates of our post! Remember to also follow us on Facebook and Instagram @CrazyAdven2ras ! BE CRAZY! Stay Adventurous! ← Best Weekend Getaway From Singapore for Foodies: Roadtrip to Malacca! Best Weekend Getaway From Singapore for Foodies: Roadtrip to Malacca!